Many people, including me, confuses two terms that are similar and opposite: centrifugal force and centripetal force. Both forces occur in the bodies in a rotating reference system. That is, from a fixed point of view (the origin of the reference system) the object in question is spinning around the origin. Actually, what is happening in the object is a compendium of forces as if we in the view of the object, move the reference system and put it in the object is having a force to one side and a speed forward, which makes an oblique vector have. 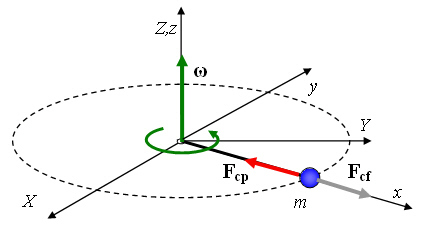 For reference system that is still, the forces exerted on the rotating are two centrifuge (which moves away from the center) and the centripetal (which points to the center to the reference system). That if, if you really look at the forces acting on the spinning object, only one is real, the centripetal, which forces him to go to the center of the reference system because it is what makes you change the path. The other, the centrifuge is a force “joke” fictitious fibs. And why it is kidding or a fictitious force?. It’s simple. Remember the three laws of Newton. Once we remember that not sure, Newton’s second law tells us that the sum of the forces acting on a system equals mass times acceleration at which the object is subjected. Until here all right. The nice thing is that if we in the spinning object, really has acceleration, constant speed (more or less) and therefore the sum of the forces… guess it has to be ?. Exactly zero. And if it is zero and has to make a force to the center it means that somewhere has to leave a force that compels him to go against because Newton’s second law is vector. Therefore, the centrifugal force does not exist, but 2 Newtons law has to be there. This is why it is a fictitious force. In the video, with the plane, you see a clear example. The boy, to make a looping (a 360 degree vertical) plane is strength to turn around and make the centrifugal force causes the water always this “down” as the center reference plane. So you can fill the glass and drink it (although it is seen that when the subject is this “ringlando” by making force). That if you have to keep in mind that the plane, making the looping, no constant acceleration and therefore the sum of the forces is not zero, so, if you look, but it behaves “normal” is not entirely normal. But it is a change of acceleration so small that it is negligible.